From the publishers of Perfect Dog, the highest-rated, most-popular dog app in the App Store comes Purrfect Cat Pro: The Ultimate Breed Guide to Cats. Meow! Finally, the quintessential breed guide to cats has arrived. Now professional feline fanciers can have the world of cats in the palm of their hand, or paw, if you will. With exquisite hi-res photos and encyclopedic information on over 90 popular and rare cat breeds, Purrfect Cat Pro provides details on breed history, appearance, temperament, intelligence, grooming, and many more cat specifics. Paws down, this AD FREE app is the cat’s meow. Purrfect Cat Pro also provides fascinating and unusual facts about cats. For example, do you know that some cat breeds can swim? Or that some cat breeds get along great with dogs? You’ll find these answers and many more fun facts in Purrfect Cat Pro - Ultimate Breed Guide To Cats, it is unquestionably the most comprehensive reference guide on cat breeds available. With Purrfect Cat Pro - Ultimate Breed Guide To Cats, each cat breed is cataloged alphabetically with a thumbnail image and breed name. This app makes scrolling through cat breeds easy and intuitive! Users may also instantly search for their ‘purrfect’ cat breed by selecting simple yet reliable lifestyle settings (e.g. active or lap cat, mouse catcher or not) or by indicating desired physical attributes (e.g. long hair, short hair). The app then provides a list of breeds that matches selected criteria. 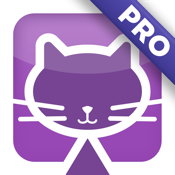 If you seek in-depth knowledge about cats, are planning to add a cat to your family and want to find one that suits your lifestyle, or simply want to identify a cat you have seen, Purrfect Cat Pro - Ultimate Breed Guide To Cats is the app for you!